Perfect and easy to use! Simple to use scooter that would work wonders for most people. It has automatic folding and only weighs 60lbs including the battery making it very easy to load into your car. It is well worth its price and provides excellent features that are easy to use. 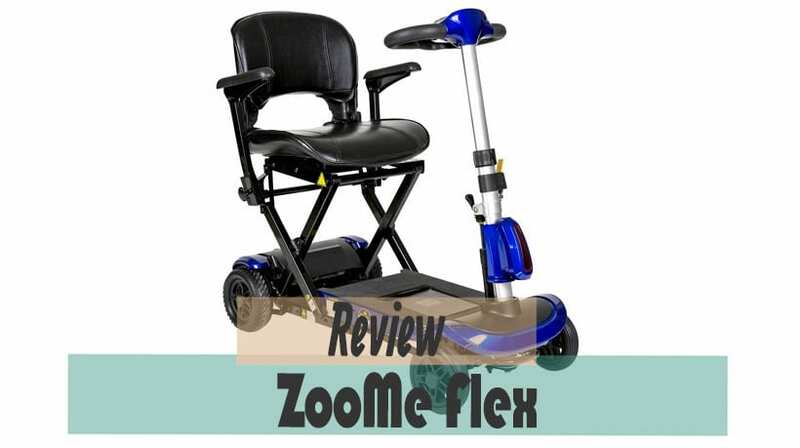 Drive Medical has released a new mobility scooter called the Zoome Flex. Those of us who know the disability scooter madness know that Zoome from the beginning is their recreational 3-wheeled unit. The flex is, however, nothing like that unit. It is a much more stable, comfortable and portable mobility model. If you are interested in know exactly what we think about it and where the Zoome Flex outperforms its competition, keep on reading the review. The Zoome Flex are Drive Medicals new 4-wheeled unit that has been stripped down in weight and has a whole new folding function, a function that we have never before seen on any of their previous scooters. This ZooMe Flex is a result of their efforts to try and grab a spot as a viable option for those in need of a lightweight and easy to fold mobility scooter. Drive Medical is already famous for their well-built and affordable models, like the Scout which is by far one of the most popular models amongst people suffering from a disability. There is no question that the Zoome flex is a good contender and it will probably win over more than a few hearts within the travel scooter community. Going through the numbers are not always that interesting, but we have tried to make it simple and easier for you to digest by adding a few comments on each part. Top speed: 4 mph, a decent enough speed to get you around comfortably and safely. Distance per charge: 13 miles, the maximum distance you can get on a fully charged battery under optimal conditions. Weight Capacity: 300lbs, just like most other travel scooters they do not accommodate anyone above 300 pounds. Brakes: Electromagnetic, an electronic braking system that uses the magnets of the electric motor in order to slow down the scooter. Maximum climb: 6 degrees, this is enough to get you up most mobility ramps. Total weight: 60 lbs, the unit can not be disassembled into multiple pieces except for detaching the battery which weighs only 5 lbs. This leaves you with a unit of 55 lbs that you need to make sure you are able to lift in order to transport it by car. Turning radius: 47.2”, how much space you need in order to be able to turn the whole scooter around without knocking things over. Ground clearance: 1.6”, is the standard of mobility scooters and it gets you over most thresholds except for unnecessarily high ones. Motor: 24v x 120W, a small but lightweight motor that fits perfectly on your mobility scooter. It uses rear wheel drive which provides you with increased grip due to the nature of weight distributed on the scooter when riding. Battery: 10ah 29.6V, this gives you a nice speed and good distance without adding much to the weight of the unit. Also, the battery is airline approved. A fully electronic folding system which is beautifully crafted to aid those with problems folding and unfolding a scooter on their own. With the press of a button on the remote control, they can easily fold it together in as little as 15 seconds with minimal effort. Utilizing an aluminum frame to lower the weight giving the end user a lightweight scooter that is much easier to handle without the need for a helping hand. Since this is a travel scooter they’ve gone the extra mile and equipped it with an airline approved lithium battery of 10ah and 29.6V. To charge the unit you use a 2ah lithium UL approved charger that will recharge your scooter fully in about 5 hours, give or take an hour. The battery can only be charged while mounted correctly to the mobility scooter, meaning you can’t charge the battery off-board. Using a delta tiller to steer with is perfect for people with less arm strength and it really makes steering a lot softer and easier. The delta tiller is also highly adjustable so you can sit comfortably while still being able to maximize the steering capabilities. It is equipped with a locking mechanism so you need to use a key to be able to drive it. It also comes with a key fob to fold and unfold the scooter. The conclusion I make after taking it for a test spin is that there are little to no early-stage problems, we’ve consulted with a few other clients and they’ve had the same experience as we have. The battery is a bit tricky to detach from the scooter at first, but you’ll get the hang of it. That is basically it, we discovered nothing more that we felt was out of order. So who would benefit the most from the Zoome auto-flex? I think this is a great choice for seniors and those of us who might not have a helping hand around at all times. It folds with ease in less than 15 seconds and the lightweight frame makes it very easy to handle and taking it in your car won’t be a problem for most people. It provides you with a decent speed and good range at a really good price point, combining that with the Drive Medical brand and after-sales service. You have yourself an excellent scooter that will stand by your side for years to come. My husband & I purchased 2 of these units. #1 in May/2018 & #2 in Oct/2018. #1 has been used about 15 times. #2 has been used about 5 times. Both units no longer unfold, even tho’ fully charged. They both failed within 3 days of each other. #2 failed first, the remote just beeps, but won’t open the scooter, neither does the button over-ride at the back of scooter. #1 failed 3 days later, sitting in open position, key out of ignition, scooter just started to fold all by itself…scary & dangerous!! Now scooter will not open with key or button over-ride. We’re currently trying to find someone to diagnose & correct this problem. Wow, that does not sound like a good problem to have. I am happy you reached out Thea, this is key information to have for our visitors. I wish I could give you some help at least to make it fold out so you can operate it.